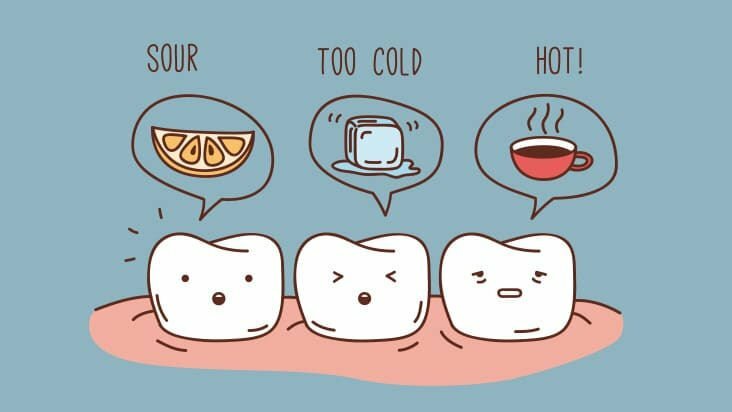 Do your teeth hurt when you eat or drink something cold or sweet or hot or sour? How about when they’re exposed to air? Tooth sensitivity is a pretty common problem – though how common has been a matter of debate. A new review of 65 papers involving 77 studies and nearly 100,000 patients found that “the best estimate” of sensitivity is 11.5%. Each tooth in your mouth consists of three levels of tissue. Enamel covers the outside, protecting the softer dentin below. This tissue – which surrounds the third layer, the living pulp of the tooth – consists of miles of microscopic tubules and is also rich with nerve endings. When enamel is lost, the dentin is exposed. When stimulated – by a cold drink, say, or a bite of something sweet – you experience pain. One of the most common causes is enamel loss due to high consumption of acidic foods. Soda is perhaps the most notorious culprit. But any acidic food or beverage – even some mouthwashes – can accelerate enamel erosion and lead to tooth sensitivity. Brushing too hard or using a hard-bristled brush. Bruxing (habitual grinding or clenching). Gum recession, exposing the roots (which aren’t protected by enamel but a softer tissue called cementum). Tooth whitening systems and toothpastes. If the sensitivity persists, it’s important to consult your dentist. Once we see the condition of your teeth and identify the cause(s), we can develop a treatment plan for you to address the issue. Try MI Paste – a topical tooth cream we’ve found to be effective for reducing tooth sensitivity. Switch to a desensitizing toothpaste. Be sure to opt for a fluoride-free brand or variety. Try a softer toothbrush. If you’re already using a soft-bristled brush, practice brushing with less pressure or force than you usually do. Various natural remedies may alleviate tooth pain of all sorts. Common ones include clove, vanilla extract, and arnica. Turmeric may also be effective – massaged on the teeth or applied as a topical paste. If you’ve recently had dental work, have your dentist check your bite. Likewise, if the pain persists, see your dentist. You don’t have to live with dental pain – and you shouldn’t. While it may cost a bit up front, the long-term savings are significant (not to mention the value of your feeling better). Most dental problems tend to get more expensive and challenging to fix the longer they’re ignored.